Harvest season means late nights and early mornings. It means missing out on important milestones. It means working an insane number of hours each day to get your olives picked and processed. It’s a sacrifice. But it’s one that the Coldani family is happy to make. And today, two generations of family are working together to build an olive oil empire to sustain the next generation of farmers. 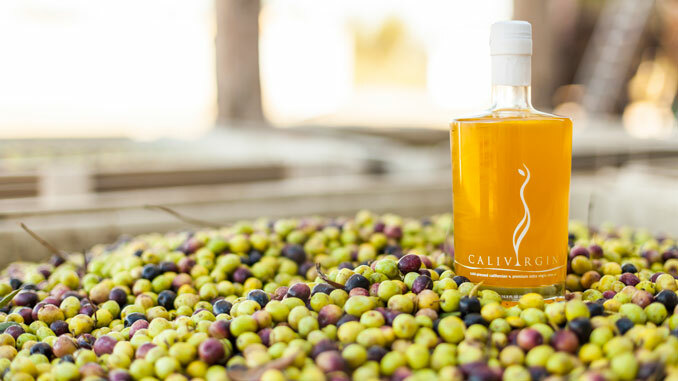 The Coldani family owns and operates Calivirgin Olive Oil, based in Lodi where their roots run deep and their passion for the craft grows every day. It’s a family business started by Jeannie and Steve Coldani, and for the past several years, head by their children Gina and Mike, and his wife Julie. They all wear many hats, as family businesses often go. From harvesting and processing to marketing and trade, they each play an important role in running the family business. From the branch to the bottle, the road to award-winning extra virgin olive oil is a complicated orchestra of schedules and equipment, but it all begins in the field. Their orchards near Interstate 5 and Highway 12 are planted with tight, manicured rows of olive trees. This trellis system, developed in Spain and adopted by the Coldanis, allows the olives to be mechanically harvested and opened the floodgate for faster processing and a fresher product. As the olives ripen and the days grow shorter, the family preps their harvesters and equipment for a solid month of constant use. And then, as sure as the sun shines, the season beckons the Coldani family to their olive orchards for their favorite time of year—harvest! Mike Coldani takes samples from the olives to test their oil content, assuring him harvest time is here. As they continue to ripen, the polyphenols decrease, and he knows its time to go. Meanwhile, Julie rushes the kids to school, attends a meeting for the school’s harvest fair, and then heads back to work to arrange for the ordering and delivery of the fresh produce to arrive just in time for harvest. You see, Calivirgin is famous for their vibrant and delicious flavored olive oils. But, what makes their olive oil different from many of the competitors on the market? Calivirgin crushes and mills the fresh fruit or herbs directly with the olives. The oils from the produce are extracted and the result is an intense and fresh-flavored olive oil. It’s a challenge coordinating the delivery of the produce to coincide with the harvest, but it’s an important job to keep their continuous flow machine running. Their current flavor line-up includes: basil, lemon, garlic, oregano, blood orange, habanero, jalapeno, and garlic jalapeno. Each morning at 5 a.m., Mike jumps on the mechanical harvester and begins picking the olives into macro bins. After a few loads, he heads back to begin milling. There are always four crew members to watch and run the machine, checking for M.O.O., AKA, material other than olives. Both Jeannie and Julie alternate in cooking the harvest crew’s lunch and dinner. It means they are coordinating meals and schedules to make sure everyone is nourished for the arduous month. “Sometimes it’s two people sitting down to grab a quick meal, sometimes there are ten people,” Julie laughs. “I like to bring our kids along to see their dad at work.” It forces them to be flexible as a family and Mike and Julie think it’s an important lesson for the children to see them hard at work. But, they do have one rule during harvest. They try and take off Sunday every week to spend time with their family. After working 15 to 18-hour days, it allows them to recharge and take a breath from the bustle of harvest. And if harvest leaves them with any spare time, fear not, their season also coincides with the busiest retail time of the year—the fourth quarter! So, while Mike is busy harvesting, the rest of the family is coordinating sales and marketing campaigns to push their brand-new product with consumers. Calivirgin is thrilled to have their products featured in Williams Sonoma, but most of their efforts to sell their olive oil is grass roots. They attend the local Farmers Markets, community events, and food festivals, and promote their membership and corporate gift programs to consumers. Needless to say, the Coldani family keeps busy. Be sure to stop by and taste their fresh from the farm olive oil in the next few weeks and stay tuned for upcoming news on their major expansion. It won’t be long before you can taste olive oil, sip the family’s wine and watch the entire harvest process from the branch to the bottle! Can you say liquid gold mine?